Holly Hinsenkamp (left) started the student group Give BackHolly Hinsenkamp (NMC ’19) spent a semester at a large university. But, she didn’t find the close-knit feel she was looking for. So, she returned to her hometown and enrolled at Northwestern Michigan College. It was exactly what she was looking for. Holly loves the one-on-one attention she gets in her smaller classes. She’s found it easy to get involved on campus, starting her own student group called Give Back. The group helps others in the community through a variety of service projects. There were a few things that inspired Holly to start Give Back. 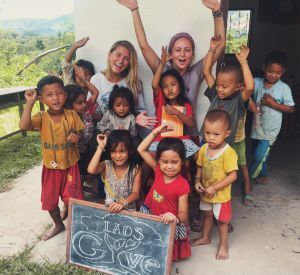 She has traveled to places like Laos to help others, and wanted to create a group that would give her classmates the opportunity to experience the joy of freely giving back. “I think they taught me more than I taught them” she says, reflecting on the people she helped in Laos. YOU are also the inspiration for her philanthropy. She recognizes how important your willingness to give back is to her NMC experience, and thanks you for your example. She wants you to know she’s grateful for your support of NMC, students, and this community.